This all new fabulous luxury SUV sports a V8 engine with 270 horsepower. The All-Wheel Drive gives it teeth, agility and mobility in inclement weather. 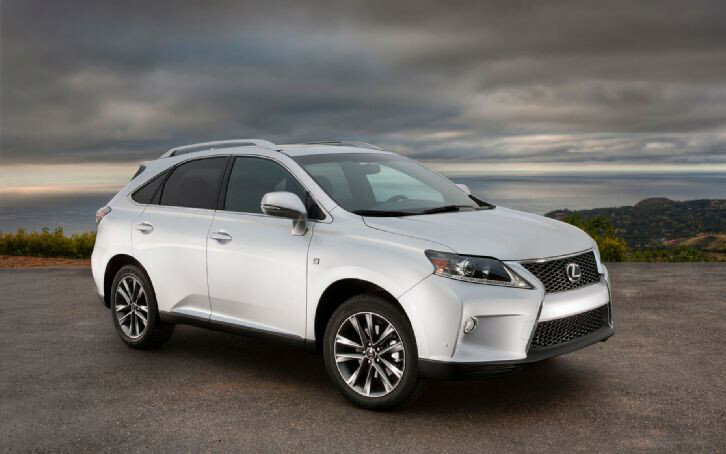 The 2013 RX 350 is a handler, grabbing the road responsively, yet with sophistication like riding in your own personal limo. Fast and remarkably smooth acceleration. The driver has the utmost control. It is simply a pleasurable and exciting vehicle to drive. There is a snow mode, eco mode and normal to use in your distinct and daily driving conditions. It's not a race car, but you surely won't have to worry about merging into lanes on the highway, either. In fact it can be surprisingly fast when you ask it to do so. Handling is responsive, reassuring, and the suspension was amazingly capable of making potholes disappear. 20 highway/18 city - wow, not much disparity here, a missed opportunity Pretty decent mileage-20 miles per gallon overall is the federal rating and that's exactly what we got right on the money. City rating is 18 and highway mileage rating is 24, and the combined rating is 20 miles per gallon. With annual fuel costs estimated at $2,650 based on 15,000 miles of driving per year at $3.55 cents per gallon. You will spend $1,650 more in fuel costs, the government says, over five years than you will on the average new vehicle. Expensive, bold, tasteful and refined describes the elements of the vehicle's interior. Perforated, leather grip steering, paddle shifters (I know I know - we do think they are goofy and a 'guy' thing). A very clean and laid out dash - all visible and within grasp. Add daring red, leather seats and attractive trim-elegance invites. Shhhhhh, the Lexus is by far a quiet ride. It transports five passengers quite comfortably and has the power liftgate in the rear for easy access when unloading gear. The vehicle is available in three trims and is also available in a hybrid. Bluetooth phone and audio connectivity, as well as push button start. The vehicle that got arguably was the most significant player in lighting the original fire in the luxury crossover market is still one of the two or three best in the segment. Long lines of new competitors has done little to change that, in our view. Sure, there are a few luxury features you won't find in the RX350, at least in its current iteration. You still have a step on parking brake instead of the automatically released electric setup, for instance, found on many competitors. And space, cup holders and other interior amenities aren't as generous as you may find elsewhere. But never mind all that. Line our Claret metallic test example up against any comer, with its subtle use of chrome gleaming and its new and more aggressive grille shining confidently, and it more than holds its own in the valet derby at the nearest luxury hotel. We'll almost guarantee that it will be picked out as the most expensive-and attractive model among its competitors. And that Claret color, by the way, is a welcome departure from the silvers, creams and whites that we see on so many RX350 vehicles on the road. Airbags abound for driver, front passenger and back seat passengers, SOS button to depress whenever in need, Brake assist, Electronic Brakeforce Distribution, Vehicle Stability Control, Energy Managing Crumble Zone, Blind Spot Monitor, Child Safety Locks, LATCH system in back seats. Safety equipment is generous, too. They include SmartStop technology, electronic brakeforce distribution, brake assist and vehicle stability control, energy managing crumple zones, a host of airbags of various kinds, and SOS assist button in case of emergencies, and enhanced roadside assistance, among other things. Bluetooth , Sirius, LCD screen allows for customized audio and ventilation settings, Premium audio, Dual zone climate control for personalized control, Reclining seat and multi-position seats for driver and passenger, Push button start, Lexus Infotainment system with each year gets even more refined. By the way, our team still had some challenges getting this system to work correctly - and easily. If you do have any challenges or would like more instruction, there are Lexus technitians at each dealership. Simply make an appointment to see that individual and spend as much as you need with them to get you're your questions answered. Our suggestion? Be sure to get their card and email address and Twitter handle when you leave. Standard equipment included the 3.5 liter 270 horsepower, four cam, 24 valve v-8 engine with variable valve timing, six speed automatic with a snow mode that can be activated at the first sign of a flake, electric rack and pinion steering, full time all wheel drive, a premium audio system, dual zone climate control, full power accessories, reclining and sliding 40/20/40 rear seat, SmartAccess passive entry system, LCD screen for audio and ventilation settings, multi-information display with Lexus personalized settings, trip computer and outdoor temperature display and countless other items. Options were also plentiful on our tester: a comfort package, an upgraded audio package, a navigation package, intuitive parking assist, an excellent Lexus Enform package and many other items, all of which brought the final price to $50,860.00. Exquisite design, trim, color choices. Love the LED lights. The grill and aggressive look is not overstated, but has put Lexus in a more advantageous position over the few years versus some of the mid-upper tier luxury brands like Infiniti, Acura, etc. Kudos to the Lexus and Toyota leadership team for positioning the brand where it is now. It's an expensive looking, understated automobile, elegant in an unobtrusive way. 4 year/50,000 miles Basic. 5 years/70,000 miles Powertrain. 4 years/50,000 miles basic coverage,5 years/70,000 miles powertrain coverage.